Water-covered roads in Letart Township made driving impossible. National Weather Service reported three inches of rain Friday evening, but many local rain gages read five inches or more. Winds flattened entire fields of young corn. Stocks of corn twisted by high winds. 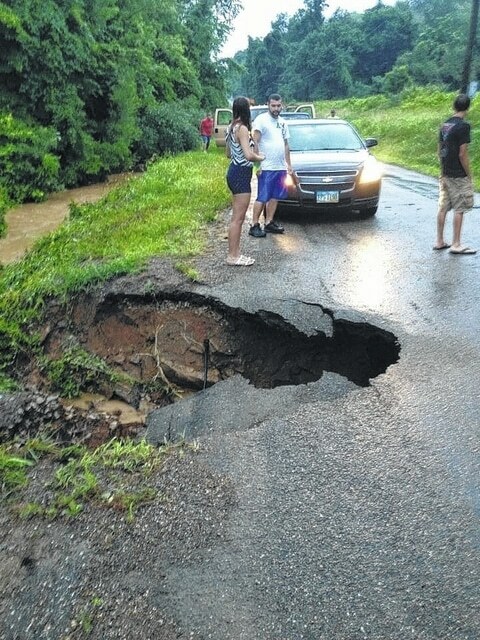 A section of Hill Road in Letart Township gave way Friday during torrential downpour. OHIO VALLEY — A supercell thunderstorm brought rain, wind and hail to southeastern Ohio on Friday evening. Defined as a long-lived rotating severe thunderstorm, the supercell began in western Ohio and ended near Charlottesville, Va., traveling more than 300 miles, according to the National Weather Service. The storm produced wind damage and flash flooding in the Ohio River Valley and a confirmed tornado across the river in Ripley, W.Va. The tornado was classified as an EF-0, with winds of 80 MPH. Straight-line wind was also confirmed and some of the most intense winds occurred outside the tornado’s path in what is known as a downburst. With the ground already saturated from previous rains, there was no place for the precipitation from the fast-moving storm to go. “The Bottoms,” to which the area along the river is sometimes referred, is a flat area. Small creeks and drainage areas along the roadways quickly filled with water, which spread into the road and fields, leaving motorists stranded and fields flooded. The rain came so hard and fast, soil was pushed ahead of it, leaving mud and debris in its path. Rivets ran through the soil, some as deep as three feet. Many residents in the area said the rain looked like a solid white wall as it approached and visibility was reduced to zero during the event, which lasted less than half an hour. Local farmers were out early Saturday morning assessing the damage, many commenting on the amount of rain that fell in such a short amount of time. “It was the most rain I have seen at one time in the past 20 years,” local farmer Larry Turley said. As the water drained away, the damage to crops could be seen. Roots of vegetables had been exposed. Wind had knocked down some tomatoes and other vegetables, but mostly it was water that was continuing to damage the plants. Corn may have been the most affected. Stalks lay flat in some fields, all blown in one direction. In other fields, the corn looked as if it had been swirled, randomly twisted, some still standing while others were lying in the muddy soil. So far, 2015 has not been a kind year to southeastern Ohio farmers. Large amounts of snow hampered farmers’ efforts in preparing their fields for early planting. A March snowstorm added to the woes, and it seemed to many farmers that the soil would never become dry and warm enough for planting. Just when it seemed spring had finally arrived, temperatures fluctuated and several nights of below-freezing temperatures again slowed the progress of planting. And for those plants already in the soil, the conditions were not ideal for growth. Spring seemed to finally arrive, bringing with it warm temperatures and the proper amount of precipitation. Then the rains ended. Just as farmers began to place irrigation into rows of crops, rain began again, and this time it hasn’t let up. Vegetables are planted and ripen in fairly predictable cycles; first comes cabbage by Memorial Day, tomatoes by the end of June, along with squash and zucchini in August. Next comes corn, fields becoming ready to pick weekly. Peppers and melons come next. There is a time when all the vegetable are ripe at the same time, and farmers are busy from sunrise to sunset to keep pace with the vegetables and customers who come to purchase them. This year is different; there is no cabbage, tomatoes are just beginning and farmers are hopeful they will begin producing in quantity very soon. Peppers, squash and zucchini seem to be ripening early. And the corn, the first patches less than a week from maturity when the storm hit, may be able to recover, many area farmers say. Many agricultural experts say this is a critical time of year for southeastern Ohio farmers. Crops are maturing, and the damage to them is still unknown. The soggy fields have made caring for and harvesting undamaged crops difficult. Forecasts of rain continue over the next few days. It will take much-needed sunshine and warm temperatures to dry out the fields. How this year’s crop totals will be affected by the weather events is still unknown. But crops are resilient, and farmers say they are optimistic that this will still be a good year. Lorna Hart can be reached at 740-992-2155 EXT. 2551.